When it comes to captivating and glamorous Business Cards, nothing beats our exclusive Sparkle products. The radiant glittery surface of this stock will be sure to make you the center of attention! Perfect for anyone in the entertainment, jewelry or beauty industry, our Sparkle Business Cards will make sure you stand out from crowd. 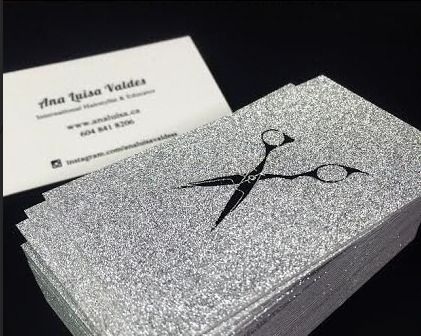 All of our Sparkle Business Cards are Duplex, meaning that you can select a cardstock of your choice for the back of your card. Choose our 17pt Smooth White Uncoated for design flexibility or for maximum dazzle, choose Sparkle for both sides. Your design is produced with a special one color process more suited to simple and bold designs that can stand out against the sparkly background. Will the sparkles come off? No, the sparkle effect of the stock will not fall off the cards. Silver is the only colour currently available, however more colours will be added in the near future. The colour will change slightly when viewed under different lighting conditions. Another way to achieve a different background colour is to print a full colour background, using the negative space of the silver sparkle stock for your design. You can still see the sparkle effect through a full bleed background. How thick is the stock? This stock is created as a 2-ply with your choice of Sparkle both sides (32 pt), or with our default 17pt 100% Recycled Smooth Uncoated white stock as the back (33pt). Other stocks can be used for the backing by Print Quote request, and will affect the final thickness of the card. What is required for the design? We are currently producing the artwork in a one colour process (Pantone preferred, CMYK also accepted) and vector format. Small fonts / fine details are not suitable on this stock. See: File Setup for Sparkle Cards. Multiple colours may be available by Print Quote request after approval of your design. Samples can be ordered in a Specialty Sample Pack. You may have seen images of these amazing new business cards featured on our social media accounts. Sparkle Business Cards are available to order now! We recommend large, bold designs that are very simple and have few fine details. Fine detail and light color choices can easily be lost in the sparkly stock. We recommend at least 2pt line thickness; however, the thicker the better on this stock. Font is recommended at a minimum 18pt to ensure it is readable. Your design must be provided in vector format as we do not accept pixel-based images or graphics (including photos) for this product. They can be submitted in Pantone (preferred) or CMYK. The closest match to your color will be made by our production team. We do not currently produce this product in combination with other print techniques like foil, embossing or letterpress. More information about file setup can be found here: File Setup for Sparkle Cards.